I wrote this story for the Dallas Morning News. It was published on June 20, 2004. It was a novel idea: Shrink cows to the size of dogs through genetic engineering. Feed them grass grown indoors and put one in every home. Finally, Cuba’s chronic milk shortage would be over. But Fidel Castro’s quest for miniature cows went nowhere. Scientists say he was a bit ahead of his time.Now, 17 years later, Cubans say they wish the plan had worked because milk is still scarce and the cattle industry is in dire straits. The illegal slaughter of the animals, a lack of money for cattle feed and the most severe drought in decades is ravaging both milk and beef production. More than 100 head of cattle are dying every day because they don’t have enough food and water, Cuba’s official media reported in April. Water levels are dropping at reservoirs in eastern Cuba. And there’s no rain in sight. Some critics say poor planning and inefficiency, not the drought, are to blame for much of the trouble. Mr. Riera’s family had a 6,000-acre cattle ranch in Cuba before the 1959 revolution. Now, he says, the number of cattle has plunged from 6.3 million in 1958 to less than 2 million today. “The regime did nothing to prevent the slaughter of countless head of cattle,” said Mr. Riera. Officials at Cuba’s Agriculture Ministry declined requests for information on cattle and the drought. Philip Peters, a Cuba expert and vice president of the Lexington Institute, a private research organization based in Arlington, Va., said: “Cuba put two good, radical ideas into practice: allowing farmers to sell their surplus, and allowing freely priced sales at 300 farmers’ markets around the country. The result was a new source of food, beyond the libreta [the food rations Cubans receive]. And the food at farmers’ markets is often of good variety and quality. “I don’t doubt that if the state lightened its hand even more, the results would again be positive,” Mr. Peters said. Cattle ranching has a rich history in Cuba. Spanish conquistador Diego Velázquez, the former governor of Cuba, brought 970 head of cattle to the island in the years 1512 to 1524. Their numbers multiplied, and many were exported throughout the Americas. 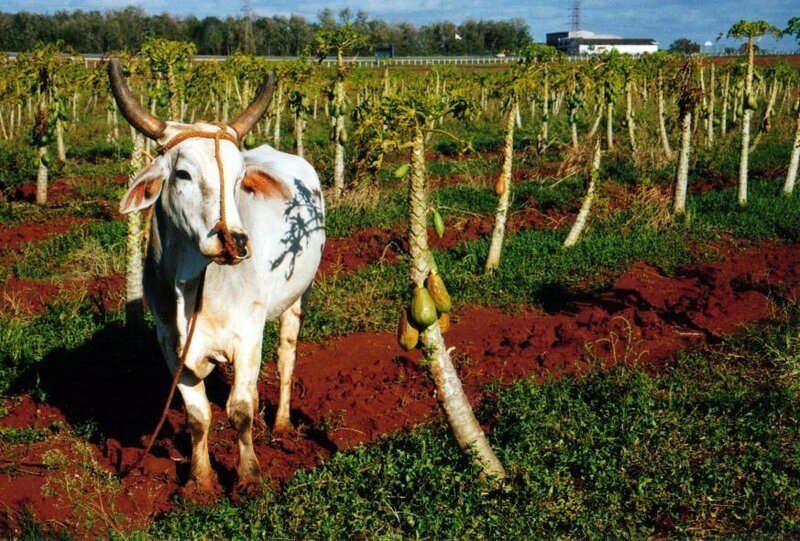 By the mid-1500s, cattle hide had replaced gold as the main currency of exchange in Cuba, said Mr. Riera, whose family got its start in cattle ranching on the island 400 years ago. “The cattle industry was the No. 1 source of income to the Cuban economy up to the end of the 18th century,” he said. From about 1800 until 1958, there was at least one head of cattle for every person in Cuba, he said. After the revolution, the government confiscated all cattle ranches larger than 66 acres. Sugar production became the priority and the number of cattle dwindled. Today, the cattle industry isn’t the only rural enterprise that’s hurting. Sugar and coffee crops are at or near their lowest levels in a half century. And Cuba is forced to import hundreds of tons of food and produce every year from the United States and other nations to feed its 11 million people. Castro loyalists say they’ve made great strides. They’ve converted sprawling, unproductive state-run farms into small, cost-effective cooperatives. They’ve created new incentives for growers, allowing them to sell surplus crops to private farmers’ markets instead of the state. And they’ve set up internationally renowned organic farms in Havana and other cities, producing more than 3 million tons of vegetables every year. The tobacco industry is another bright spot, they say. Workers have rebuilt scores of tobacco seed nurseries and leaf drying houses that were destroyed by Hurricane Lili in 2002. And this year, industry officials expect a bumper crop, enough tobacco to produce more than 150 million premium cigars. Still, the drought is a concern throughout the countryside. Not one of Cuba’s 14 provinces has had even 60 percent of its usual rainfall this year, according to Granma, the Communist Party newspaper. And last month was the country’s third-driest May in 43 years, the newspaper said. Alarmed, workers are trucking in water to more than 200,000 head of cattle in eastern Cuba. Her home is perched on a hillside overlooking the turquoise-blue Caribbean Sea. And it would probably be a paradise, maybe even the site of a spectacular hotel, if only there were enough water, she said. “We can’t grow anything, so we have very little money. That’s why I can’t afford to feed my pigs. They have to eat whatever they can find on the ground,” Ms. Pérez said. According to the government, more than 1,200 wells have dried up in Holguín province. To increase the water supply, laborers are working day and night to build a conduit from the Cauto River, the nation’s largest, to the Guirabo reservoir. The project, set to be complete in August, is expected to supply water to tens of thousands of homes and ranches. Still, hoards of cattle are likely to perish in Holguín and neighboring Camagüey province over the next few months, farmers say. To try to strengthen the herd, government officials have turned to the United States. They bought 148 head of U.S. dairy cattle last summer and have signed contracts for beef cattle, to be shipped this year. And they hope to buy many more. But for Mr. Riera, it’s too little, too late. He said it will take years to restore the Cuban cattle industry to its former grandeur. Mr. Riera, 64, lives in Miami. He said he hopes to return to Cuba someday – after Mr. Castro is gone – and help rebuild the cattle industry. He even dreams of getting back his land. But Castro loyalists say that will never happen, that the revolution will endure.